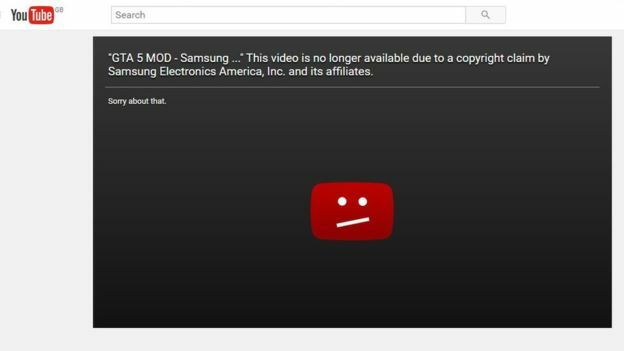 YouTube users who post videos mocking Samsung's recently-recalled Galaxy Note 7 smartphone report they get removed because of copyright claims by Samsung. The claims center on a popular add-on to the game Grand Theft Auto V, which lets players fool around with the hot handsets and use them as as grenades. This is not how copyright works, the BBC says, and is likely to only focus more attention on Samsung's failings and YouTube's own shortcomings when it comes to copyright enforcement. Samsung has not yet responded to repeated BBC requests for comment. Critics have warned that trying to remove gamers' videos will only draw more attention to them. One US gamer - known as DoctorGTA - said restrictions had been put on his YouTube account as a result of Samsung's complaint. "It's going to take three months to get the strike removed from my channel... I got my live stream taken away," he said in a video. "If I submit a counter-notification to say 'sue me', I wonder what they will do. Will they sue me, the kid that has cancer and just makes money off YouTube playing a video game?" The Note 7's propensity to burst into flames ultimately resulted in the handset being withdrawn from production and recalled from store shelves. The Federal Aviation Administration banned them from the skies, making it a federal crime to take one on board an airplane.